But in case with Arduino Nano(for example), it doesn't help. @SilvioCro Why not? Looking at a picture of the Nano (and some knockoffs), the TX1 pin is usually square, so you could work out the orientation based on that. [SOLVED] Intercept pin headers, three way or the header? [SOLVED] How to create custom through hole pad shapes in Altium Designer? 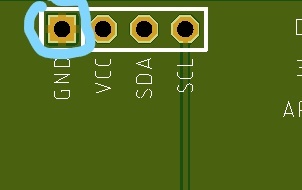 [SOLVED] Is there any way to force square header pins into round holes?